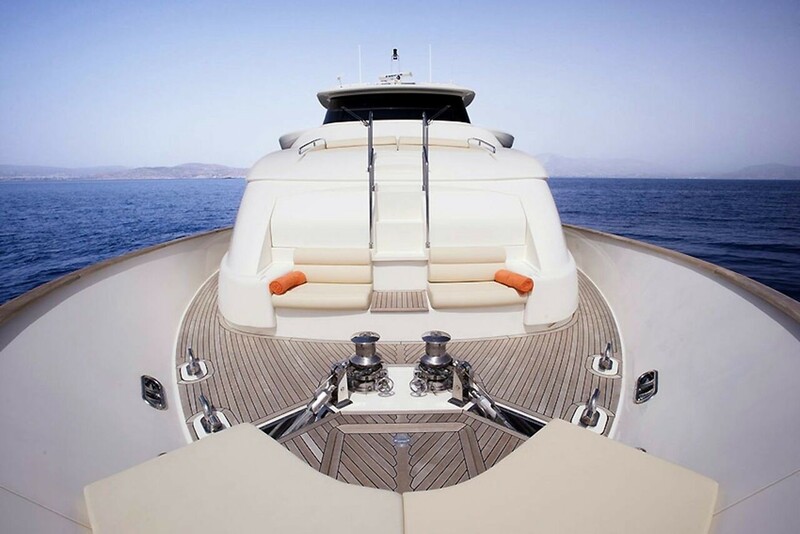 Charter yacht DANA was designed by AYT (Advanced Yacht Technology) and built by Ferretti shipyard in 2008. 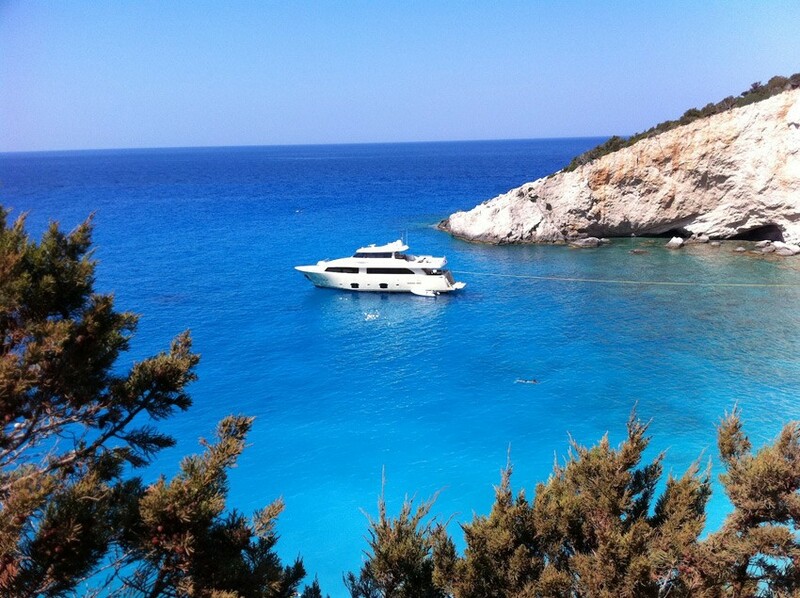 M/Y DANA measures 26.2m (86ft), she is based in Greece, available for luxury yacht charters in the East Mediterranean for up to 12 guests in 5 en-suite cabins. 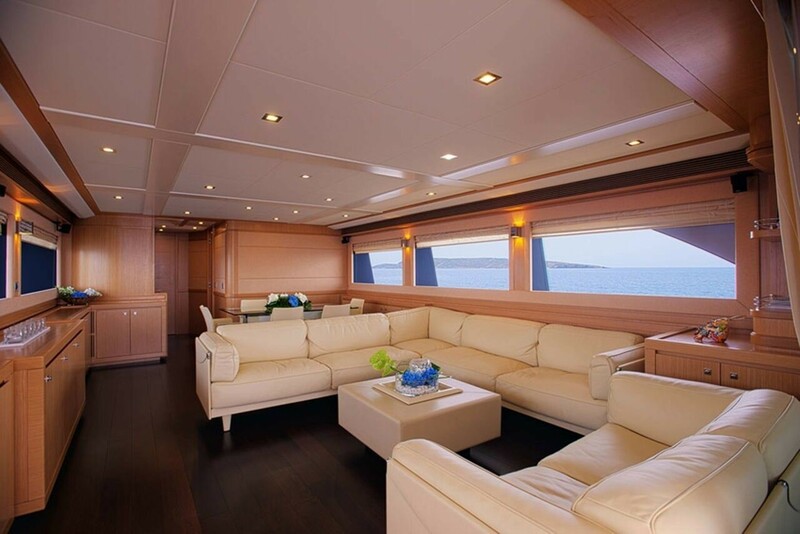 Motor yacht DANA has a modern stylish interior. The salon and dining is an open plan and features rich coffee toned dark wood floors, light honey wood panels and cream ceilings. 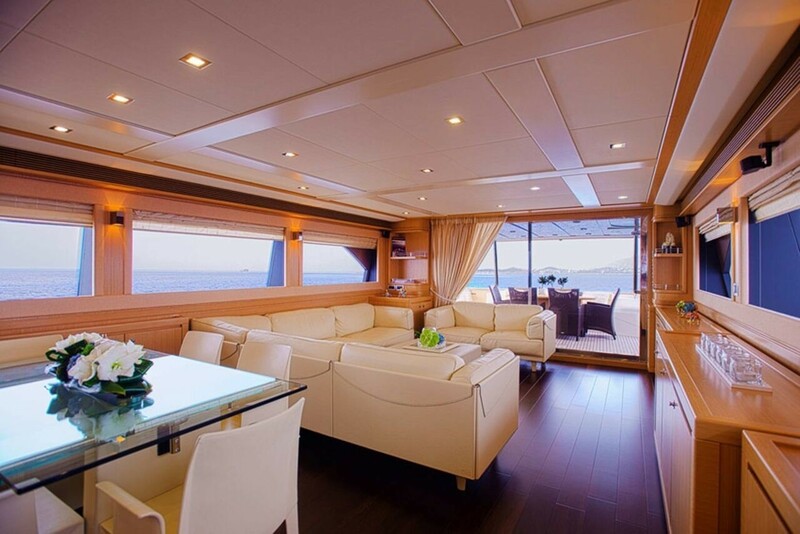 The lounge space is aft with a large leather L shaped sofa, love seat and ottoman on the starboard side, too port, guests will find a state of the art entertainment system. Forward, a clear glass formal dining table is flanked by cream leather chairs. Surrounding windows allow plenty of light to enhance the contemporary décor. 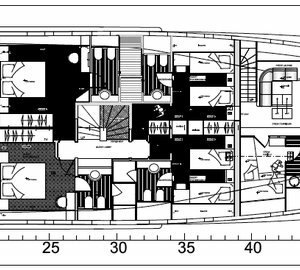 Forward of the salon is the full beam master cabin with king size bed, walk in wardrobe, private cocktail seating, TV entertainment and en-suite with his and hers sinks. 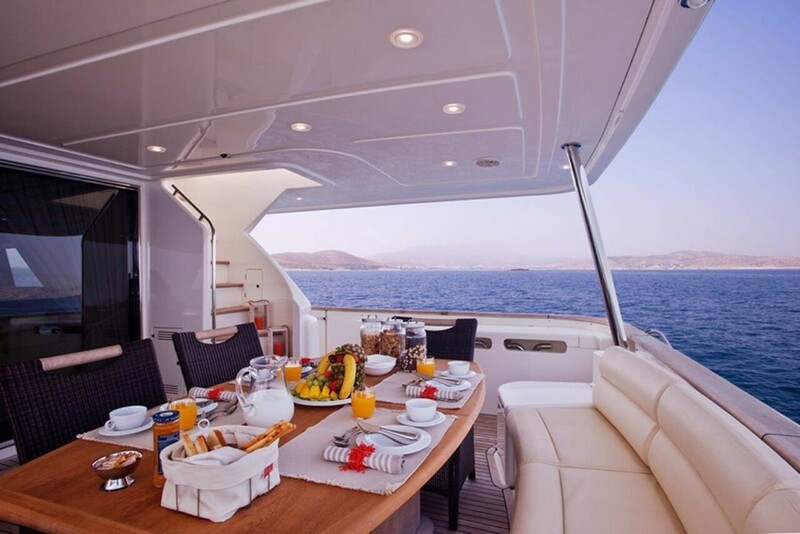 Above the main deck, the Ferretti yacht DANA offers the pilot house, here there is a further seating area and skylounge, ideal for light meals and optimum viewing. 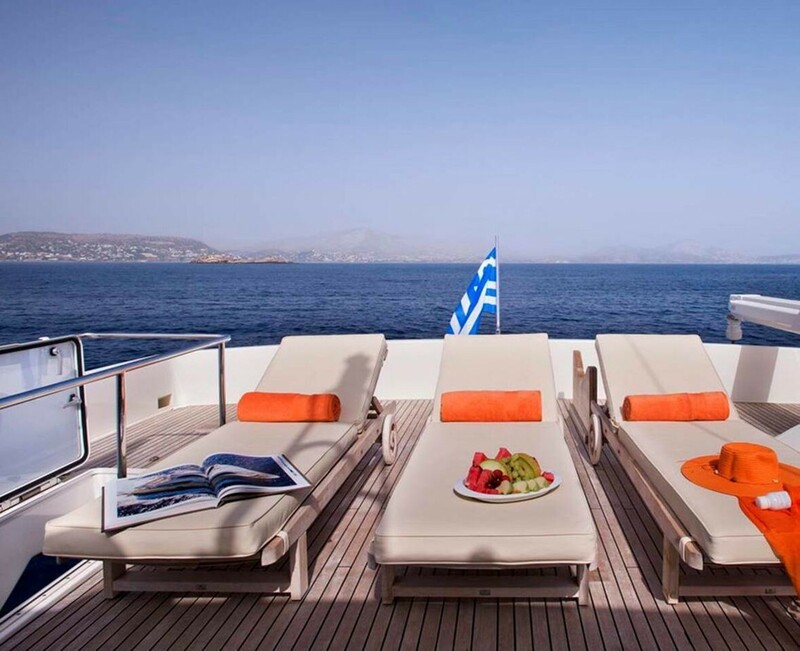 Charter yacht DANA offers plenty of outdoor deck areas. 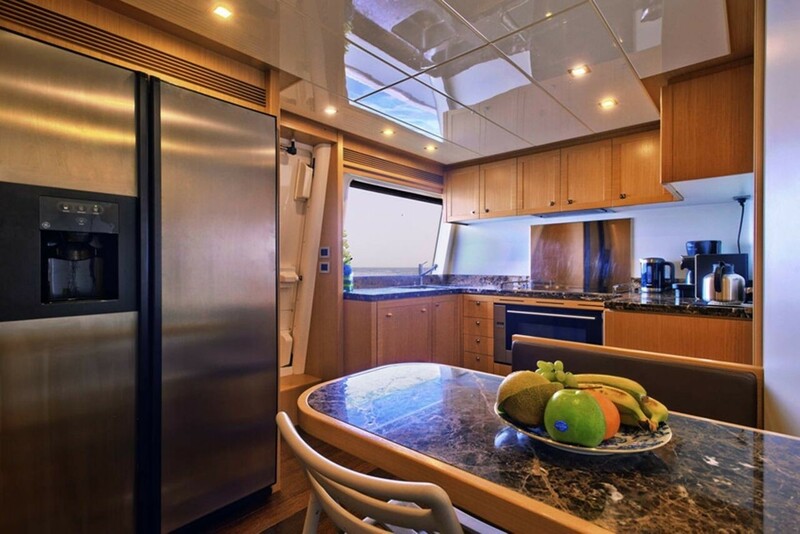 The aft deck is shaded with an alfresco dining option, it is adjacent to the salon through sliding glass doors, making it a great entertaining area. 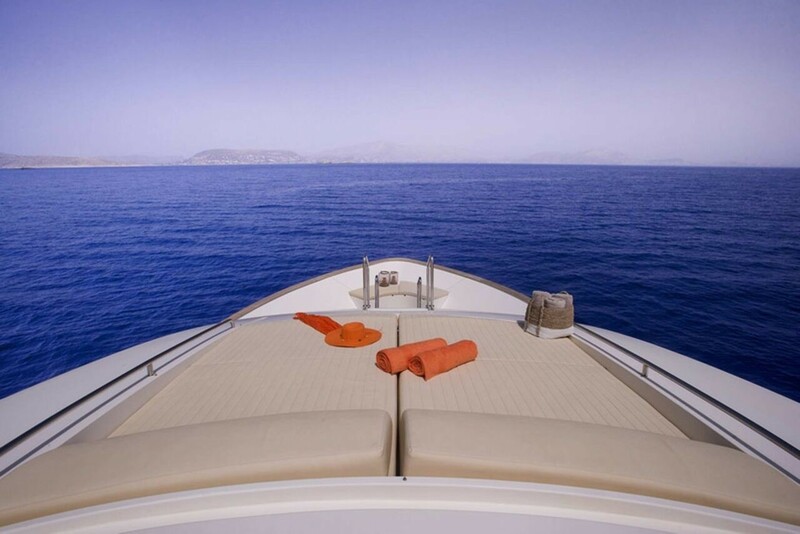 Aft, the transom offers an extended swim platform perfect to effortlessly enjoy the good range of water toys on offer, including a Jet Ski. 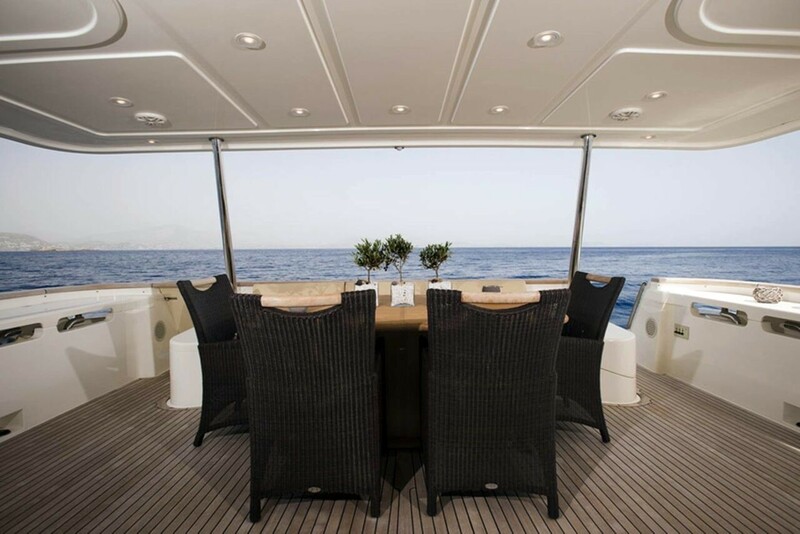 Wrap around decks lead to the foredeck where there is further private seating and a raised double sunpad. 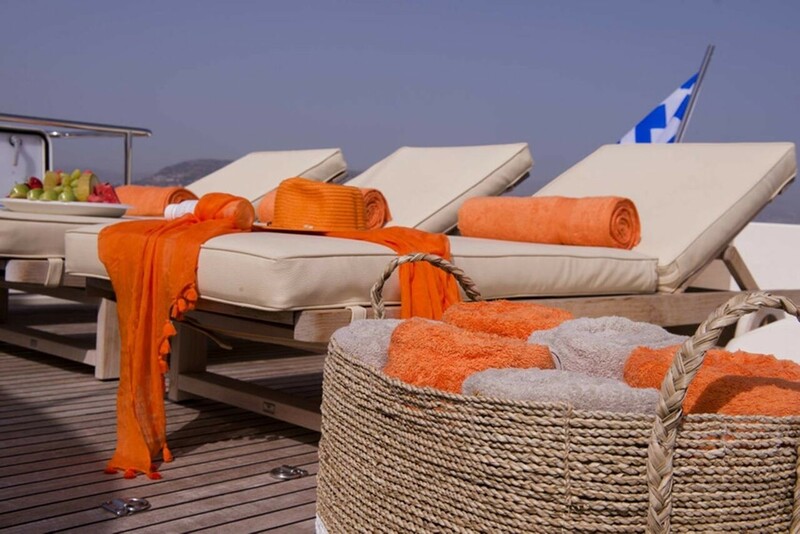 Above the main deck, motor yacht DANA has a sundeck adjacent to the skylounge with comfortable chaise lounges. 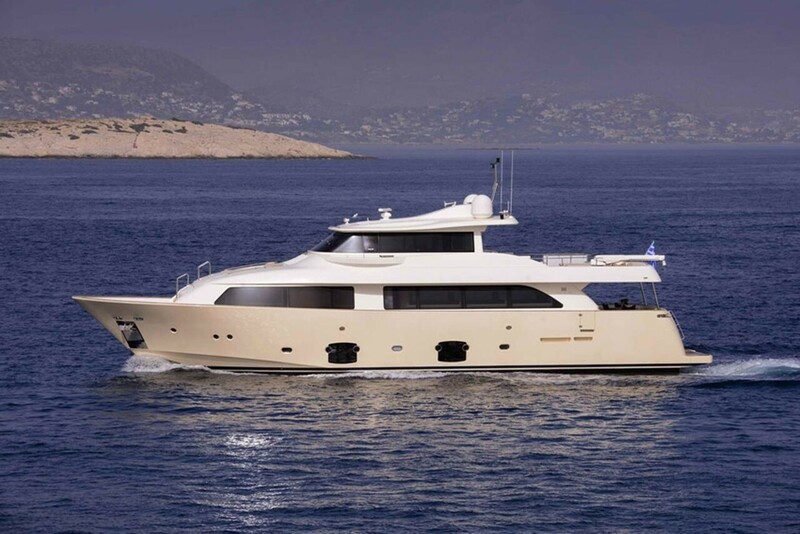 Ferretti motor yacht DANA can accommodate up to 12 guests in 5 en-suite cabins. 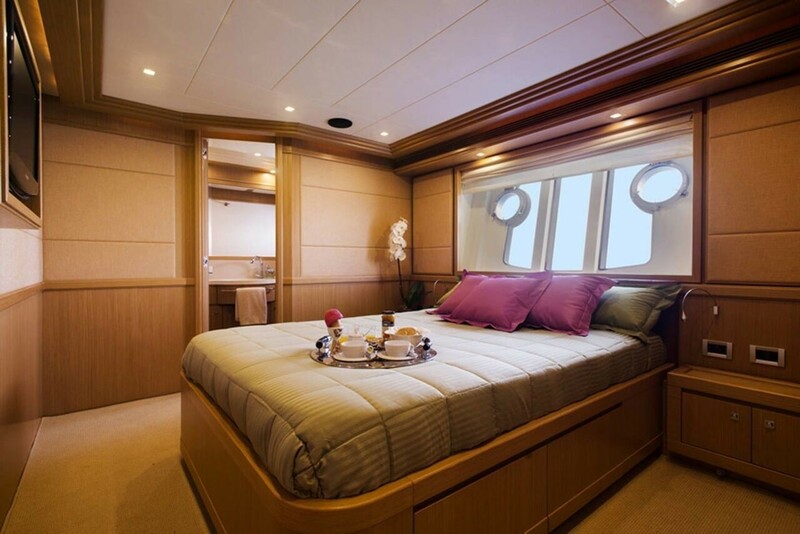 The master stateroom is on the main deck forward of the salon and full beam of the yacht with a center lined king size bed, walk in wardrobe, private cocktail area and large panoramic windows. 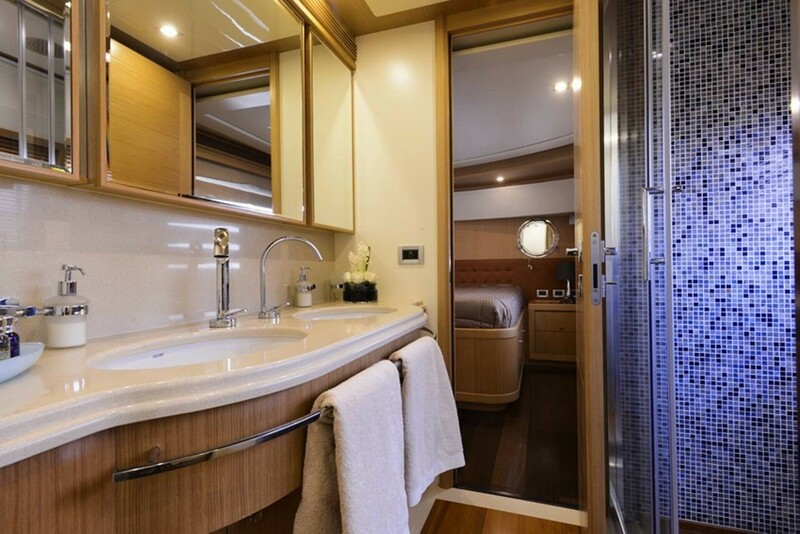 Below decks on port and starboard are 2 mirror image double cabins with walk in wardrobes, a further 2 cabins offer 2 side by side single beds and a Pullman berth each. 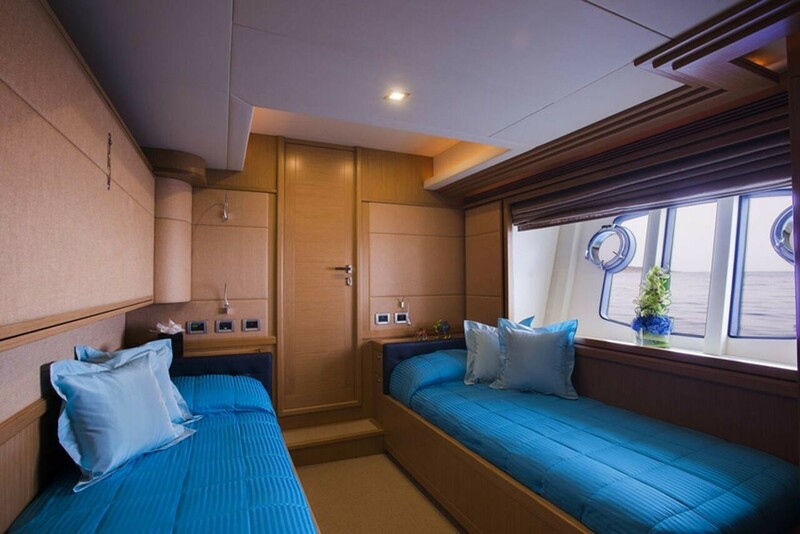 All 4 cabins below decks benefit from large hull windows providing ample natural light and scenic views. 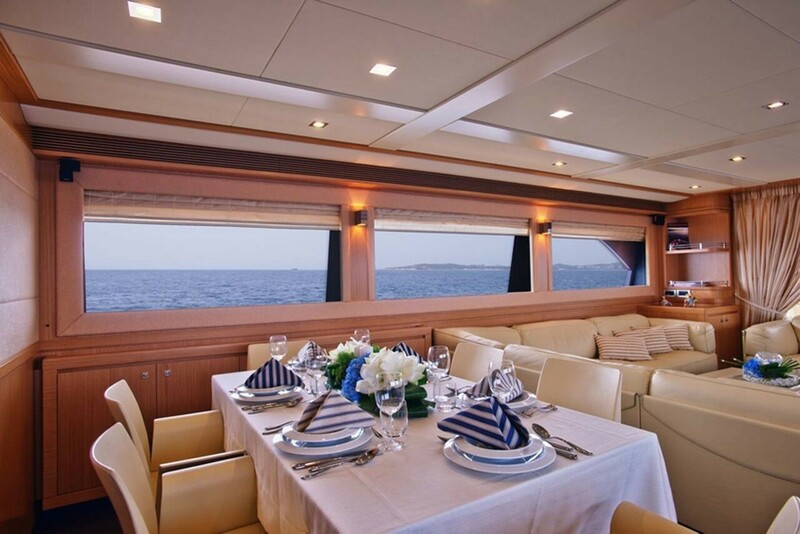 Each cabin offers TV/DVD/CD entertainment systems for optimum enjoyment. 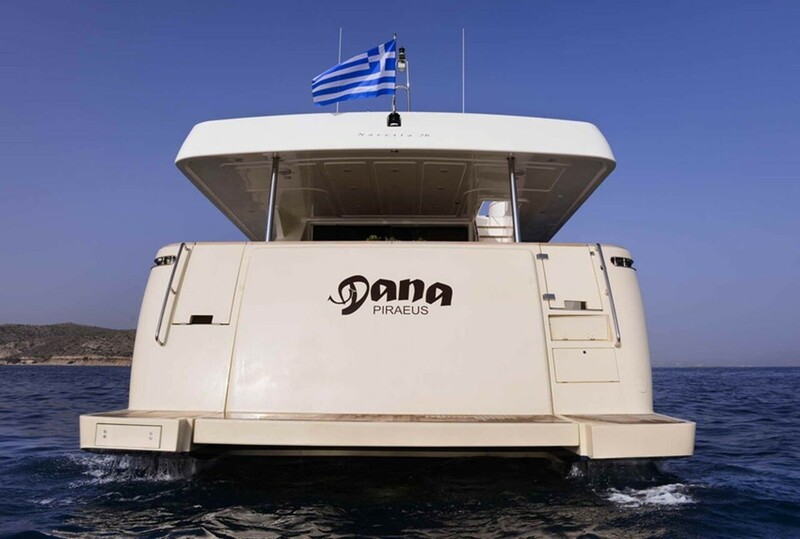 The DANA motor yacht has the following Tenders & Toys: One Novurania Deluxe 4,30m with 60hp Yamaha fuel injected four stoke outboard. One Yamaha wave runner jet ski. Water ski. Wake board. Fishing and snorkeling equipment. Sea Scooter Water Propeller. Communications include Internal communication telephones. Wi-Fi internet access over LTE & 3G. 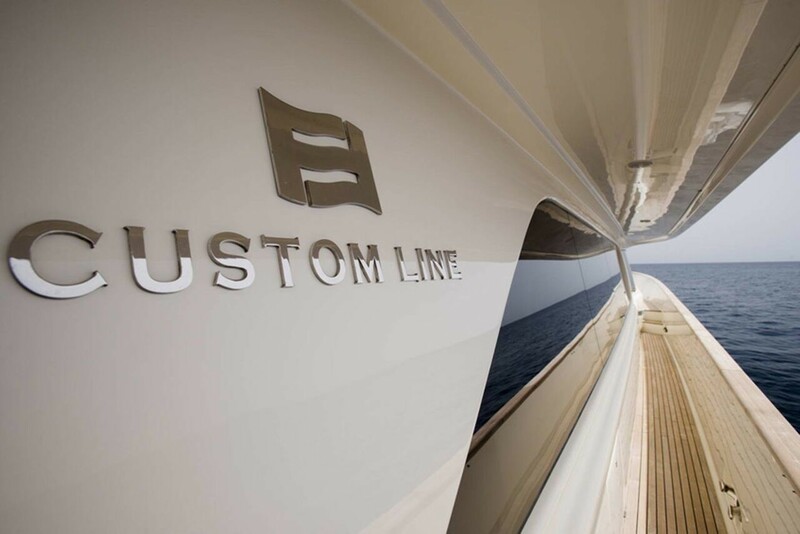 Audio Visual Equipment and Deck Facilities include LCD TV`s and AV surround systems in all cabins and in lower and upper decks salons. 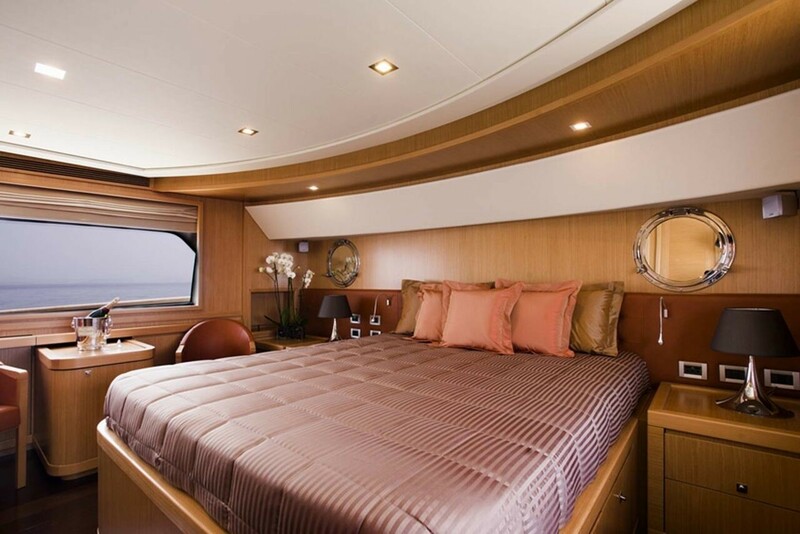 CD/DVD/MP3 players in all cabins. Satellite Receiver, iPhone/iPod/iPad charging stations Audio supported, Nitendo Wii Console, Playstation 3 Console.